The U.S. Supreme Court's decision Monday morning to hear Gill v. Whitford is good news for the millions of Americans currently being denied the right to elect representatives of their choosing due to partisan gerrymandering. 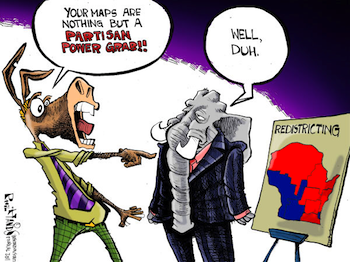 Under review is a November 2016 finding by a three-judge federal panel that the Wisconsin state lawmakers engaged in illegal partisan gerrymandering when they approved new voter boundaries in 2011. If the High Court agrees, it can end the excessive partisan manipulation of district lines across the country. Although federal courts have previously ruled against redrawing voter districts in a way that disadvantages racial minorities, this is the first-ever federal ruling that a single-member district plan was drawn illegally for partisan advantage. The 2011 Wisconsin gerrymander by the Republicans was considered to be the most partisan of any Republican gerrymander in the nation that year. For too long, the important task of redistricting has resembled a back-alley brawl: no rules, no referees, and no holds barred. Technology has made it easier than ever for self-interested legislators to manipulate districts for political advantage, so it is essential that courts step in to protect voters' fundamental constitutional rights. Partisan and racial gerrymanders drive many Americans from participating in our democratic process because they feel that their votes don’t count. Sadly, in states like Wisconsin today, many of those citizens are right. Politicians should not be choosing their voters. It’s supposed to be the other way around. In 2012 a majority of Wisconsinites who went to the polls voted for Democrats to represent them in the Wisconsin Assembly, but only 39 of 99 Assembly seats were won by Democratic candidates. The votes of Democrats essentially counted for less than those of Republicans because the districts were drawn in such a way that Democrats could not win control of the Wisconsin Assembly despite receiving more votes than Republicans. The will of the majority of voters was thwarted through the “packing” and “cracking” of votes in gerrymandered state legislative districts. That means “packing” a disfavored party’s supporters into as few districts as possible while “cracking” other districts to give the favored party a slight advantage. Both strategies dilute one party’s strength at the expense of the other. Such deliberate and excessive partisanship was ruled to be unconstitutional by the three-judge federal court panel. Wisconsin Republican Attorney General Brad Schimel appealed the federal court decision to the U.S. Supreme Court, which took the case Monday. The citizens who are challenging redistricting in Wisconsin specifically designed this case in an attempt to win over “swing” conservative Justice Anthony Kennedy, who once said he would be open to re-examining excessive partisan gerrymandering if a reasonable standard to measure it could be established. The U.S. Supreme Court on Monday stayed the federal court order for the Wisconsin Legislature to redraw the state legislative districts before November 2017. While disappointing, this is not completely surprising given the October, or later date for oral arguments. An affirmative decision to uphold the lower court decision should still leave sufficient time for the Wisconsin Legislature, and legislators in other states, to draw new, less partisan legislative districts before the 2018 elections. Wisconsin Case Could Deliver National Blow to Partisan Gerrymandering Tweet this!